Asking a question in French using inversion with je is no longer common. Je in inversion is mostly used in formal literature and deep introspection, and sometimes with “puis-je”. If you have to ask yourself something in French, use “est-ce que je”! However, for the pleasure of it, let’s just analyze the inversion with “je”. Comment allez-vous ? How are you doing? Quel âge as-tu ? How old are you? Comment s’appelle-t-il ? What is his name. 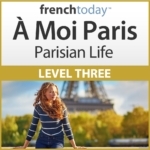 Inversion and all its rules are explained in my French learning audio method “À Moi Paris level 3“. Inversion can also be a stylistic form, with no interrogative meaning whatsoever. – “Je ne sais pas”, répondit-il nerveusement. – “I don’t know” he anxiously answered. So now let’s see specifically when we use inversion with “je” in French. I’ll start with “puis-je” since this is probably the most common use of an immersion with “je” in French. Puis-je téléphoner ? Puis-je vous aider ? Puis-je m’asseoir ? May I make a phone call? May I help you? May I seat down? The common way to ask “may I” in French would be: “est-ce que je pourrais”, or even less formal “est-ce que je peux”, or even in casual French just: “je peux” and raise your voice. Puis-je téléphoner ? Extremely formal French, pretty outdated in the spoken form now. As seen above, inversion is commonly used in literature to add information to a dialogue you are transcribing. In that context, it is no longer a question, just a style, pretty French if you want. And in that case, inversion with je is still pretty common. “Ça m’étonnerait” dis-je d’un ton amusé ! “I doubt it” I said in an amused way. “Tu verras” répondis-je. “You’ll see” I answered. Let me insist. This is used in literature. Not when writing emails or even letters… So unless you plan to write a formal novel in French, it’s unlikely you’d ever get to use it. Using Inversion in French to ask a question with “je” is still sort of common if you are in an introspective mood… So it’s quite deep! Où suis-je ? Where am I? Qui suis-je ? Who am I? Que dois-je faire ? What should I do? Note all these verbs are one syllable verbs. So easy to pronounce. To master these 4 different ways of asking questions in French (!!) 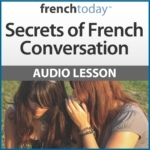 I strongly suggest you check out my downloadable audiobook “Secrets of French Conversation“. et que sais-je encore : it translates as “and what else do I know” so it means and many other things, and the list goes on. Il m’a dit qu’il n’était pas bien: qu’il était malheureux dans son travail, qu’il n’avait pas la forme, qu’il avait des doutes sur son couple… et que sais-je encore. He told me he was not doing well: he was unhappy in his work, he had no energy, he had doubts about his couple.. and the list goes on. There is a specific rule about the inversion of the pronoun subject “je” with verbs ending in ER. Actually… there are two rules! The spelling reform of 1990 actually simplified this a bit and stated that since it’s pronounced È, you could write it È.
Ok, but now let’s use this in a sentence, shall we? Hum… Examples don’t come easy BECAUSE WE JUST DON’T USE IT. Aren’t you happy you read all this? Once more, inversion with je is not common in today’s French. It’s theoretically possible, but it’s not used anymore. According to the forum “études littéraires“, the inversion with je is possible with all the verbs. However, they too agree that it’s no longer used nowadays, except sometimes in formal literature as a stylistic form. It’s important that you are familiar with inversion with “je” because you will run into it in formal French literature. However, unless you are yourself writing a formal novel in French, just stay away from it! If you have to ask a question using “je”, use “est-ce que je ?”.